The following is one in a series of updates that Jim Hug, S.J. is providing from the Just Sustainability: Hope for the Commons Conference at Seattle University from August 7-9, 2014. The Just Sustainability: Hope for the Commons began at Thursday evening, August 7 at Seattle University with a reception following three pre-conference workshops. The conference will run through Saturday August 9th and is cosponsored by Loyola University Chicago, Yes! Magazine, the U.S. Environmental Protection Agency, Puget Sound Energy, and the Bullitt Foundation. 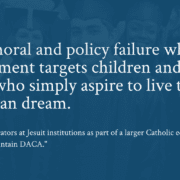 It has attracted 225 participants from 17 nations and 25 states in the U.S., including a representation from 11 of the 28 Jesuit universities in the U.S.
What keeps you awake at night? What are your fears? What Call to Action do you want to issue? The first speaker, Sarah Augustine, works with indigenous people under onslaught against their land and way of life by mining companies in Suriname. She underlined the hope she gets from indigenous people and their alternative worldviews. She also highlighted new initiatives by the World Council of Churches. She called on people everywhere to “Activate your collective.” Individual actions aren’t enough: address the institutions and structures globally that protect and legitimate corporate destructive activities worldwide. Effenus Henderson, the past diversity director for Weyerhauser, encouraged attention to the diversity of worldviews on the issues of justice and sustainability. He encouraged inclusive engagement that reaches down to the grassroots where people are often just trying to survive and are asking whether the sustainability activists “really care about me and my family and our struggles.” He also encouraged attention to institutions and structures beyond individual actions. Bill McKibben Skyped in and talked about the hope he is finding in the global movements spreading and joining around the world. He pointed to the ability of his organization, 350.org to inspire more than 20,000 demonstrations in every nation of the world except North Korea. He warned students that if they don’t get involved now, they would be spending the prime years of their lives working in disaster relief and rebuilding “until there is no civilization left to do such things.” And he challenged the Jesuit universities to catch up with the University of Dayton by disinvesting in fossil fuels and investing in alternative clean energy production. In a comment from the floor during the question period, I urged that the challenges facing us must be seen in a global context where a billion people don’t have enough to eat or clean water to drink and more than half the global population live in dehumanizing poverty. Without a doubt we need to work to address the ecological and climate issues urgently. But our vision must include making our ways of living on the planet sustainable for all its peoples, including those who must have their basic needs met with more food, drink, education, shelter, health care, and more. Three conference sessions, each offering a choice of four workshops offered by various conference participants filled out the morning and afternoon. In a final comment over dinner, tomorrow’s plenary speaker, David Korten, observed that an important difference between Bill McKibben and Denis Hayes was that Bill is organizing a movement to stop something. Denis inspired a movement to begin something new – Earth Day – which has since spawned countless new ideas and initiatives. 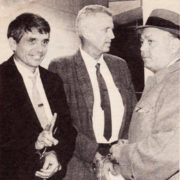 James E. Hug, S.J., has a long history working in social ethics and social justice advocacy in the Catholic community. He served 24 years as the President of the Center of Concern, a Washington, DC based social justice institute rooted in Catholic social tradition, working for greater economic, social, and ecological justice globally. He holds a doctoral degree in Christian ethics from the University of Chicago and a master’s degree in Christian spirituality from St. Louis University. Fr. Hug’s research has focused on issues of faith and economic justice and he has lectured and directed workshops throughout the U.S. and in Europe, Asia, Africa, and Australia. Currently he serves as sacramental minister for the Adrian Dominican Sisters and writes on issues of spirituality for social transformation in these difficult times. His blog, “Truth that does Justice,” can be found on the website for the Dominican Center: Spirituality for Mission, www.dominicancenter.org. Past publications have included Catholic Social Teaching: Our Best Kept Secret, Social Revelation: Profound Challenge for Christian Spirituality, and Tracing the Spirit: Communities, Social Action, and Theological Reflection. Jim has also written chapters for Globalization and Catholic Social Thought: Present Crisis, Future Hope and The Pastoral Circle Revisited: A Critical Quest for Truth and Transformation. August 9, 2014 /0 Comments/by James Hug, S.J.